Assembling the French horn is easy. If you have a bell that is attached and does not twist on, then you just take your French horn out of the case and put your mouthpiece into the leadpipe. If your bell twists on, then gently and slowly twist the bell onto the horn. A key to good horn playing is a well maintained horn. Clean your French horn regularly. This will save you money in the long run, because you won’t have to get your horn chemically cleaned several times a year. You can do a lot of maintenance yourself. You will need to purchase valve oil or rotor oil (‘Al Cass’ brand is always a good choice) for oiling the valves and valve springs. A thicker oil such as key oil or sewing machine oil works well when oiling the valve caps and the bearing next to the valve stops. You will also need to purchase a mouthpiece brush from your local music retailer or online. Wash out the tubing with plenty of warm, soapy water at least once every 3 months. This will help remove the grime. After doing so, re-rinse making sure all the soap has been rinsed out. Otherwise a soapy residue could be left inside. Oil the valves using valve or rotor oil. Oil the valve springs as well to prevent them from becoming sticky and slow. Oil the valve caps and bearing using a thicker oil such as key oil or sewing machine oil. You can never use too much oil. There is such a thing as wasting oil, but never using too much! Ideally, you should have your French horn chemically cleaned once a year. This is especially so if you tend to play your horn after eating or drinking anything sugary. Clean the mouthpiece with warm water and the mouthpiece brush, once a week. Letting your ‘water’ out: The moisture that accumulates inside the French horn is not ‘spit’. It is condensation from the player’s breath – just like the moisture from a steaming kettle that condenses on windows. 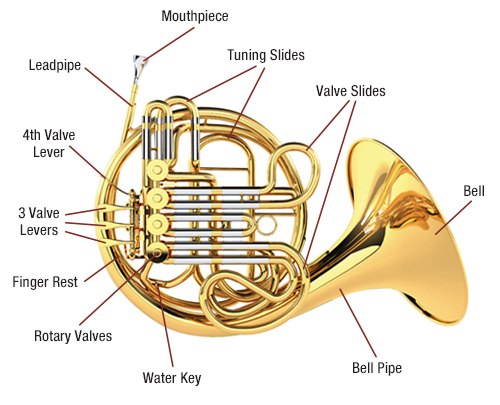 When this moisture accumulates inside the French horn, it has to be released through the water key or spit valve. Open the water key and blow air (don’t buzz) into the instrument. The French horn is a member of the brass family. If you stretched out all the tubing of the French horn into one long length, it would be more than 6 metres long! French horns have three valves and are commonly tuned in the key of F or B-flat. You can get single and double French horns. Single horns use a single set of tubes connected to the valves. This allows for simplicity of use and a much lighter weight. This is often the instrument beginners would start on. From Mozart to Mahler and Strauss to Stravinsky, the French horn’s melodic sound is commanding and mesmerising. We also have our own YouTube Channel, where you can find a collection of useful videos and tutorials.